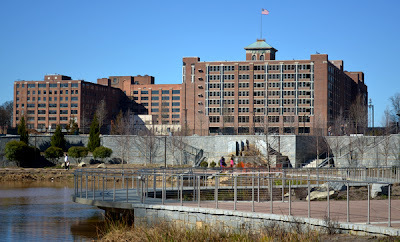 I knew there was a Park behind Ponce City Market, the old Sears Building/City Hall East, but I had no idea there was such a huge Park! Mostly because so much of it is below street level. Old Fourth Ward Park was a wonderful surprise! The only part of the Park that I visited on this particular day was the below street level portion, and the paths surrounding it. 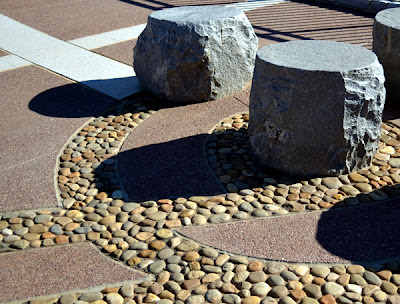 There are stone 'sculptures', water features, winding paths, and an ampitheatre, which fellow blogger Terry Kearns, author of Architecture Tourist, told me that he went to a lovely wedding there not too long ago. I can see how the ampitheatre would be a perfect setting for such an occasion. Since visiting I've seen photos of the Park during the warmer weather—growing season—and it's really quite beautiful. I thought it was rather remarkable even in the winter. 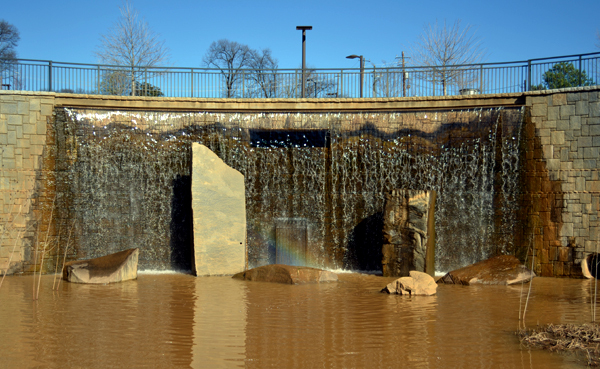 The Park's design affords vistas near and far of the various features. 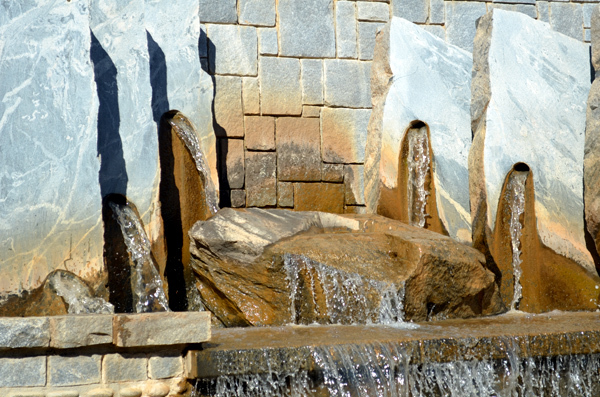 This particular water feature—a waterfall—is impressive from every angle, and there are lots of angles for this feature. 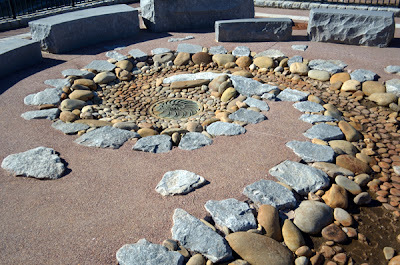 Throughout the park there's lots of boulders and cut stone, placed with purpose. One of the history-telling features of the Park—some may think that it's merely decorative, like I did—is the 100 Year Storm Line. It runs the entire perimeter of the Park! 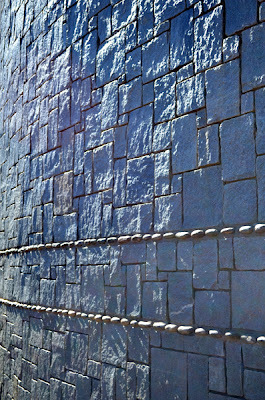 I mentioned the cut stone throughout the Park...I should have said "sliced" stone. 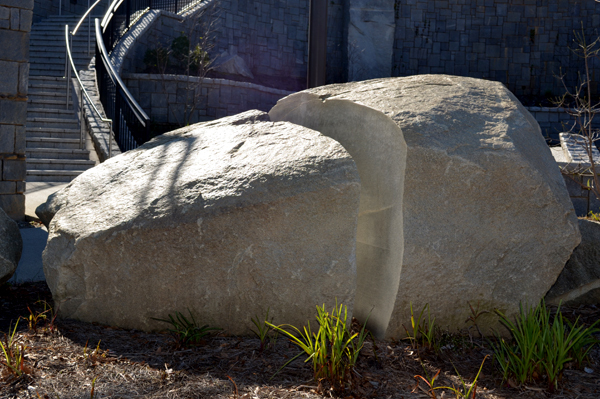 Note this boulder is missing a slice...making it more than a big rock, it's now a sculpture! 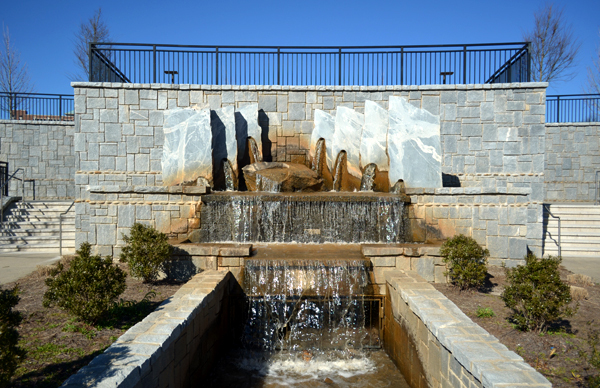 This beautiful fountain prominently features sliced stone. 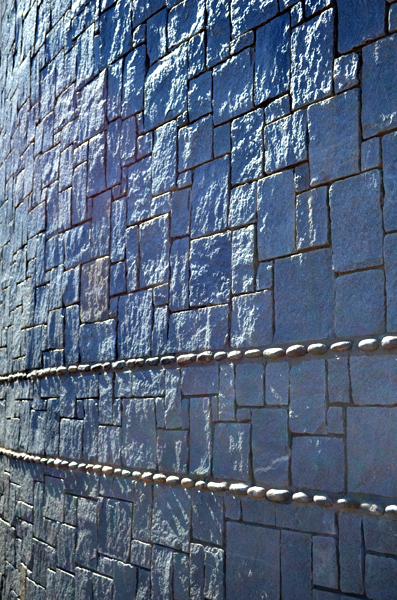 If you look closely, you'll notice that this collection of monoliths were "sliced" from a single stone (maybe two, one for each side). It's brilliant, I think...that kind of artistic design makes the already interesting fountain worthy of further study beyond noticing its beauty. On the path above the recessed portion of Old Fourth Ward Park are design elements that please the mind and eyes, like these "stools" where a walker or biker might rest for a moment, contemplating what one does when resting in a beautiful park. 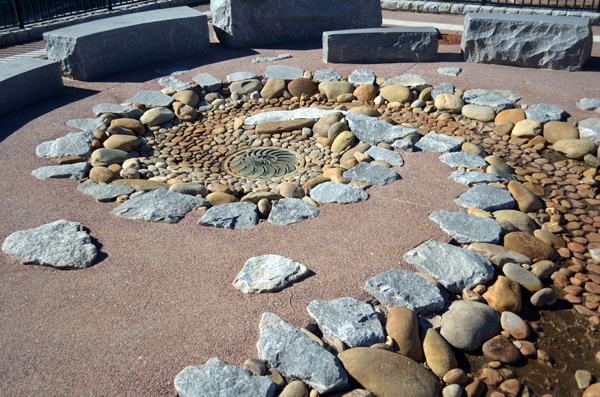 Another seating area features a spiral drain, reached by a spiral and winding dry bed creek that feeds from another section of the Park, across a street. The entrance we took into the Park was on the Ponce City Market side. The bright blue glass and stone planters immediately caught our attention an was foretelling of some of the surprises we would soon discover. Our time in the Park met with all kinds of visitors from senior couples out for a stroll, to kids playing hide and seek, to young professionals play croquet! There were a number of parents there with their kids, including one dad who had taken out this twin girls to give their mother a little personal time...great dad and husband! With so many friends who are new mothers, I understand the importance of the oh so precious personal time, which is incredibly rare for a while after becoming a new parent. One of the best features of this new Park is its location! It's all about location, right? It's surrounded by a residential area, Ponce City Market, and it'll be a stop on the Atlanta Beltline! 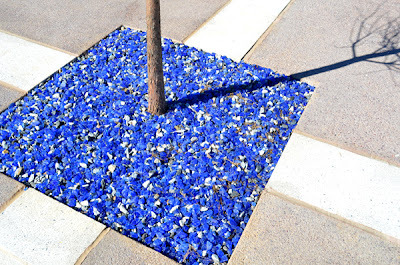 I for one am very excited about this Park and its growing popularity. 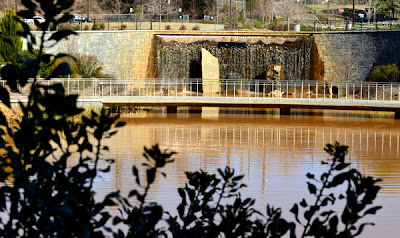 I can hardly wait to go back to see the rest of it! 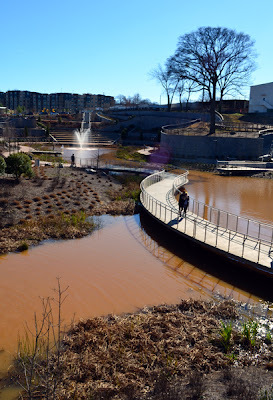 Head over to the wanderlust ATLANTA Facebook Page for a few more photos of the Park...and be sure to "Like" the Page while you're there, please. 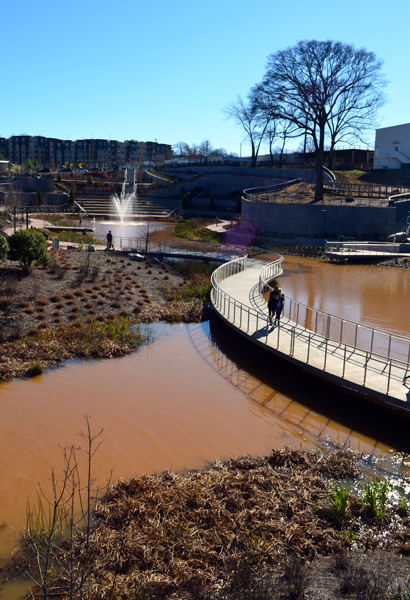 Here's a little more about the Park, video courtesy of the Old Fourth Ward Park Conservancy...please visit their site, too! 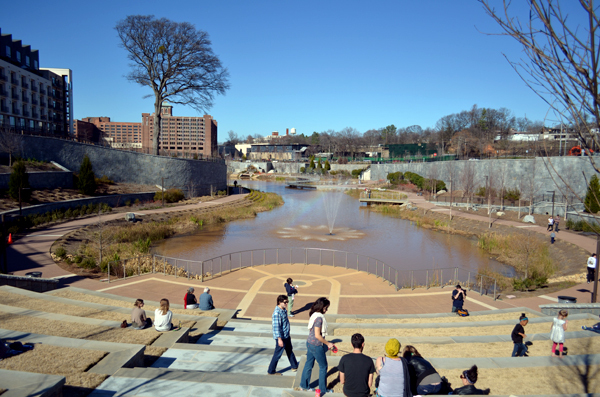 Historic Fourth Ward Park from Atlanta Regional Commission on Vimeo.